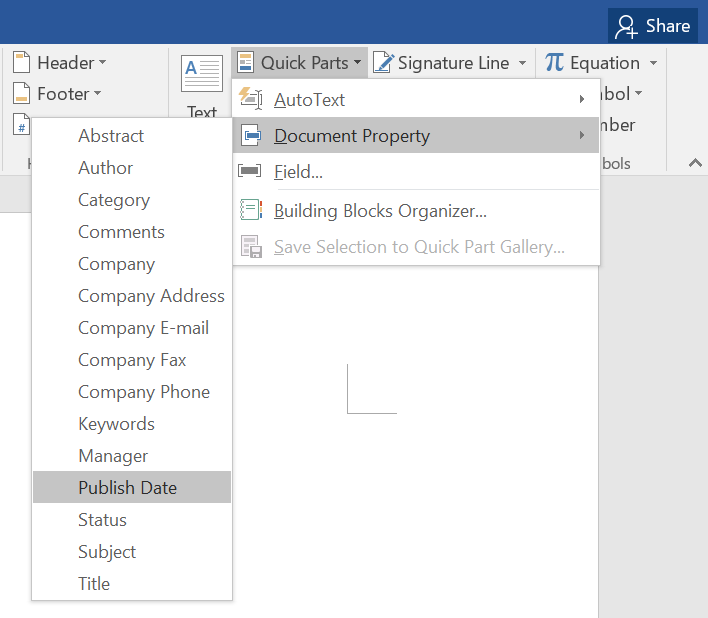 Home » Tech Tips » Apps » How to Create Reusable Content Blocks in Microsoft Word? Most of us use Microsoft Office for professional and personal purposes. When you create many documents, you may need to use same content blocks on some of your documents. For example, you have a company logo in WordArt and need to insert on all the documents. Another example is that you want to insert notes on certain pages in pre-formatted text block. 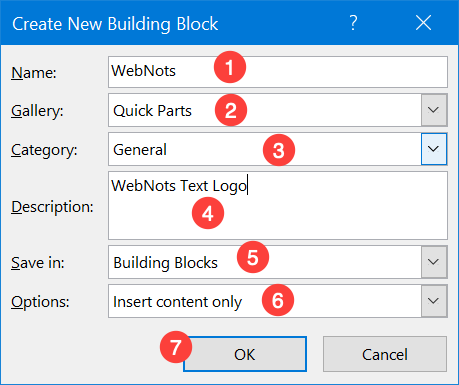 Word by default offers many reusable building blocks; however, you can also create reusable content blocks in Microsoft Word based on your need. Related: How to changed embedded file name in Office documents? 1. What is Content Block? 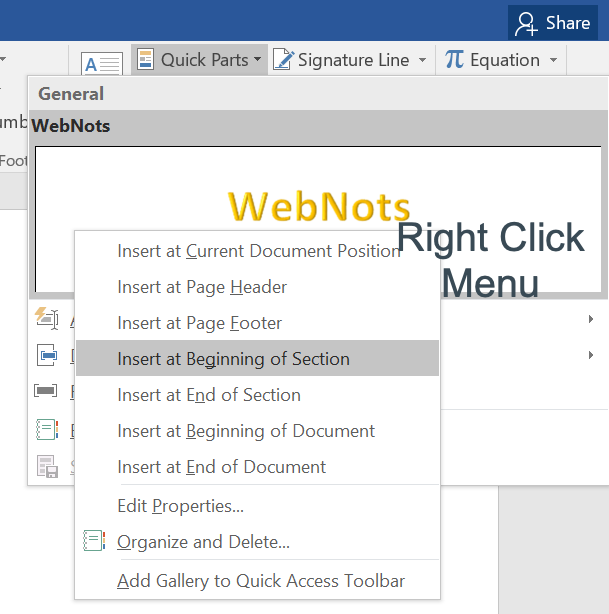 Open a new Word document and navigate to “Insert” tab. Here you can see many pre-defined blocks for Cover Page, Shapes, WordArt, Header, Footer, etc. For example, click on the “Header” and choose one of the available design for your document. The advantage of the building blocks is that they are available on the Word global document template and you can use on all your documents with few clicks. You can also create and save custom building blocks so that you can insert anywhere on your documents. Since there are so many content blocks available in Word, finding it will be a difficult task. 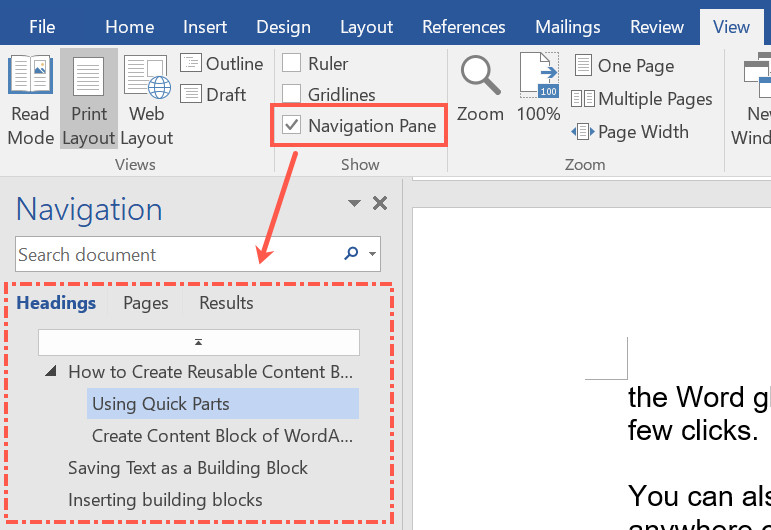 However, Word offers a Quick Parts option to find all the reusable content blocks in one place. Click on the “Quick Parts” option under “Insert” tab. You can use Auto Text, Document Property and Field options to quickly insert reusable blocks on documents. For example, you can quickly insert the published date of a document by selecting the “Publish Date” option from “Document Property”. Click on the “Building Blocks Organizer…” option to view all the available building blocks. You can quickly filter with the “Gallery” column to select the required content block. For example, select “Double Table” option from “Tables” “Gallery” column. Preview the table and click on “Insert” to add on your document. Be cautious before deleting any of the built-in content blocks category items. You may not be able to recover the block permanently. We also don’t recommend editing the properties of the default content blocks. If you want to have custom blocks then create a new block and customize as per your requirement. Related: Quickly insert dividers in Word. Before we create custom block, you can easily insert the blocks using the name and F3 key. As you can see, Double Table is the name of the block, which is unique on the template level. Simply type double table and press F3 key to insert a table. Similarly, you can insert any content blocks available in the Quick Parts. As explained above, reusing existing blocks may not be helpful for inserting your company logo or any custom text blocks. Let us explain two cases for creating content blocks in Word. It is obvious; you may need to use elements like company logo frequently on your documents. In order to improve your productivity and avoid repeatedly creating / formatting a logo, save it as a reusable content building block. You can use the logo later any point of time and on any Word documents. First select your logo and go to “Insert > Quick Parts” and choose “Save Selection to Quick Part Gallery” option. Word will open a pop-up for creating a custom building block. Name – unique name for your block, ensure to provide a name that does not already exist. By default, Word uses the “General” category for its own quick parts. You can also define your own categories if necessary. You can use this category name to filter the custom blocks when searching. Gallery – select where you want to add your building block. We recommend selecting “Quick Parts” so that you can access the block from “Quick Parts” drop-down menu. However, you can select any available gallery like “Header” and the custom block will be added under that section. 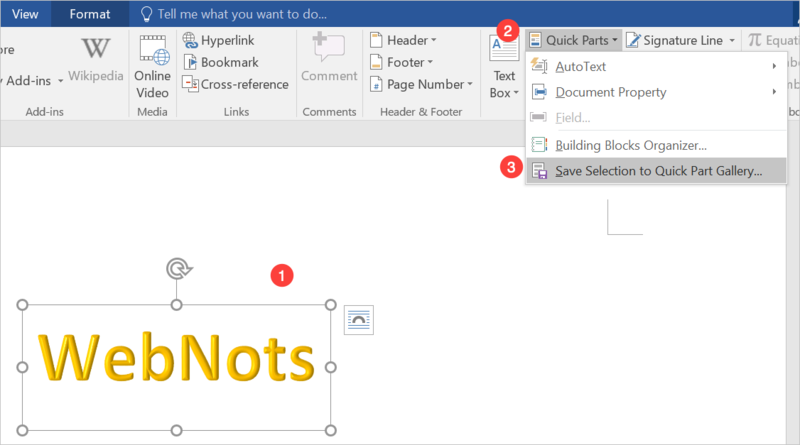 Word saves graphic elements of text boxes automatically in the “Building Blocks” template. You can also choose “Normal” template or ay other global template you use. Remember, both these templates are global which means your custom block will be available on all the documents. Click on the “Options” dropdown to choose how you want to insert the block. You can choose to save only inserting the content, inserting on own paragraph or inserting on own page. Now confirm the settings with “OK” and check the logo block under “Quick Parts”. You can quickly insert anywhere on your documents and save time in formatting repeatedly. You can save any element in a document as a quick part, including titles, formatting and graphics. Similar to logo as explained above, you can also save text passages. Frequently used phrases like headings, signatures or an opening passage can so be inserted easily. Select the text block on your document. This time, use the keyboard shortcut Alt+ F3 to open the dialog window. Word uses the beginning of the text as the name of the building block. Replace it with a more meaningful name. This quick part contains only text and is saved in the “Normal” file template. Confirm the settings with “OK”. 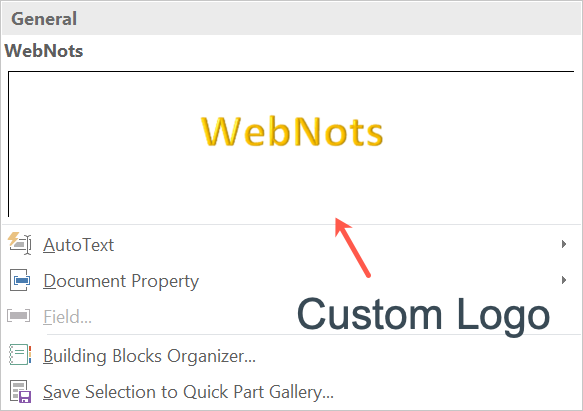 You can view the custom text block under “Quick Parts > AutoText” section. Once you have defined the building blocks you need, you can place them in your document whenever you like. Using a simple function you can precisely insert your building blocks and so save a lot of time and energy. Enter the name of the building block. Press the F3 key to insert the quick part. After inserting the block, you can edit it in the normal way. 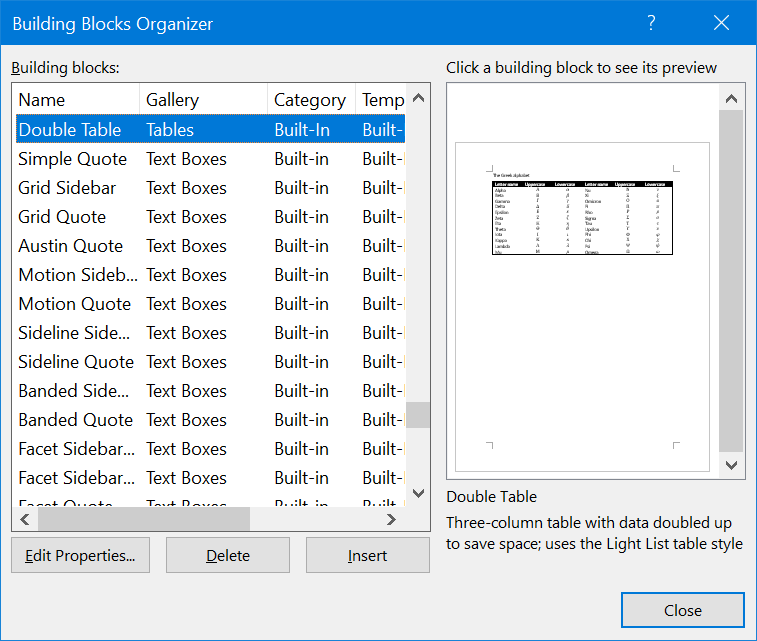 Word provides another option for inserting building blocks. To do this, open the “Insert” tab and the “Quick Parts” menu. Choose the block you have previously saved from the list. Remember that the text you have saved as “Normal” template appears under the “AutoText” submenu. However, the logo you have saved as “Building Blocks” will appear right under the “Quick Parts” drop-down. You can also right click on the custom block under “Quick Parts” menu and choose where you want to insert the block on your document. Note: Whenever you enter the name of a building block text, Word will recognize it while you are typing. You can see this in a small window and insert the building block using the return key. Related: How to create eBook in Microsoft Word? In addition to creating building blocks, you can structure your document with headings. When using heading, enable the “Navigation Pane” under “View” tab. Now, you can see all the heading structure of your document. Simply drag and drop the heading block up or down to move the entire content under the heading. This will help you to easily organize the structure of your document after writing the content. You can also select the content block on your document, simply drag and drop anywhere to move the entire block.